For one school in particular this has been a significant issue this year (2017). In September 2016, the Bursar at Lucton School in Herefordshire asked us for a feasibility study on the relative merits of installing a biomass system on his estate. The estate was on oil, so we were sure there was potential; but with renewables it’s always important to do the cost/benefit analysis carefully before committing to an installation. 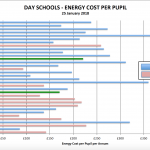 Our modelling established that the most cost-effective option for the school would be a medium-scale district heating system serving the whole site. However, it would have to be commissioned and registered with Ofgem prior to the impending changes in RHI tariff. 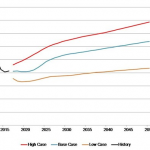 The financial case stacked up well on the old rates, but it would not be viable on the new rates. At the time the government had announced that the changes would happen in April 2017. As it turned out, the changes were delayed by some 6 months, but nobody could have foreseen that and no responsible school bursar or contractor could plan on it: so the latest safe date for registering with Ofgem was agreed as 1st April 2017. A biomass system on this scale can take anything from about 4-6 months to complete, so time was of the essence. We were financing and managing the project, so we had to ensure the deadline would be met, but without any short-cuts or increased technical risk. The school had to be quick in considering the case and getting Governing Body approval; (any bursar reading this will know that that is not easy but Lucton School were exemplary in their efficiency). Ecovision, who won the tender for installer, had to meet a challenging timescale and budget. In the end the project went remarkably well. Anyone who has ever been involved with biomass will know that there are almost always technical challenges: it’s not the same as bunging in a gas or oil boiler, but in the right circumstances the financial and carbon rewards are worth it. At Lucton, for example, tasks such as trenching for the district system still had to be scheduled to minimise disruption for the school, even though time was short: school life has to go on. Well done to Ecovision for meeting the 1st April 2017 deadline successfully. The system is now all up and running and we’ll be going back to the school in the coming winter months to confirm that it’s performing as modelled and also to check that the school support staff are happy with it. System size: 500kW. Anticipated net benefit over the life of the 20-year RHI subsidy, including having paid off the finance, is £600,000.